Documentation: Specimens: montana, UNSM ZM10416, 30 Nov 1910 Crawford, Dawes Co; leucura, UNSM ZM7127, 29 Nov 1932 Lancaster Co.
Subspecies that might be expected to occur in Nebraska are alascensis, flammula, montana, and leucura. Bruner et al (1904) listed leucura as occurring in Nebraska, as did AOU (1957), citing a record at Neligh, Antelope Co, and Rapp et al (1958) stated that leucura had occurred “as far west as Grand Island and Long Pine.” Bruner et al (1904) assumed that montana might occur in Nebraska; Rapp et al (1958) noted that montana had been “reported from the Panhandle region”, while AOU (1957) confirmed that montana wintered to western Nebraska. Fall arrival dates cluster in early Nov and spring departure dates in early to mid-Mar. There are earlier fall reports 11 Oct 1966 Lincoln Co and 30 Oct 1932 Adams Co and later spring reports 16 May 1938 Lincoln Co, 22 May 1988 a well-described female Scotts Bluff Co (Cortelyou 1988), 28 May 1943 Logan Co, and 10 Jun 2000, a male at Wildcat Hills NC, Scotts Bluff Co.
No irruptions have taken place since the early 1970s and since 1980 there have been only two winters with more than one report, 2012-2013 and 2015-2016 (see below). Adkisson (1999) noted that most Pine Grosbeaks winter within the breeding range and movements are generally triggered by scarcity of food supplies; the paucity of reports in Nebraska since 1980 suggests winters warm enough since then to obviate eruptions. Pine Grosbeak may breed sporadically in the Black Hills of South Dakota, although breeding has not been proven (Tallman et al 2002). Faulkner (2010) observed that birds that wintered in lower-elevation riparian areas “not unusually” remained into May. Most Nebraska reports are from “invasion” winters, including 1910-11, 1932-33 (many reports), 1962-63, 1963-64, 1966-67, 1969-70 (many reports), and 1970-71. The species was described as “numerous” in Dodge Co in winter 1946-47, through May, and there were a few reports in Adams Co during the invasion winter 1932-33 (Jorgensen 2012). The reports from winter 2012-2013 are of a female late fall 2012- 28 Jan 2013 Dakota Co (Brogie 2014), one was reported in Lancaster Co 7 Feb, and one was in Seward Co Jan-15 Feb (Silcock 2013). In 2015-2016, a female or immature was seen by many at Forest Lawn Cemetery, Omaha, Douglas Co 19 Dec- 9 Feb 2015-2016 (Brogie 2016, 2017) and three were reported in Lancaster Co 1 Feb 2016 (eBird.org, accessed April 2018; not accepted by NOURC, Brogie 2017). Outside of these two recent winters, there are these reports since 1980, scattered statewide: 19 Dec 2004 female Lancaster Co (Brogie 2006), 18 Dec 1983 Lincoln Co, 20 Dec 2004 male Grant, Perkins Co (Brogie 2005), 29 Dec 2000 Lincoln Co (Jorgensen 2002), 11 Feb 2015 “russet-headed” female or juvenile Furnas Co (Silcock 2015) and 22 May 1988 Scotts Bluff Co (Cortelyou 1988, see below). A report of 3-5 at Wildcat Hills NC, Scotts Bluff Co 30 May 2011 was undocumented (eBird.org, accessed April 2018). 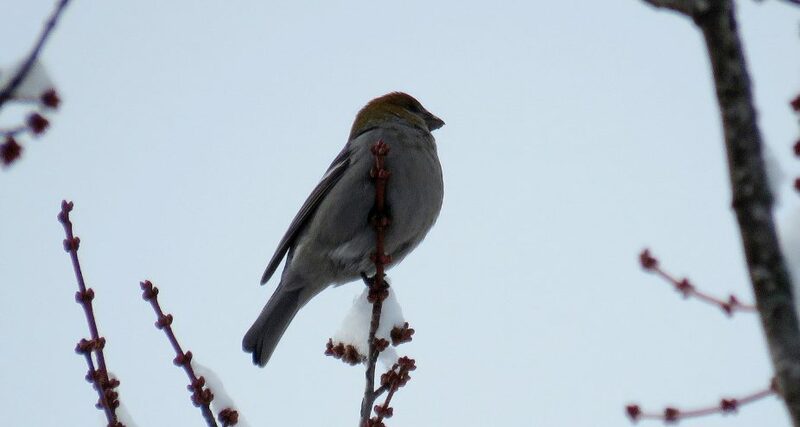 Photograph (top) of a Pine Grosbeak at Forest Lawn Cemetery, Douglas Co 24 Dec 2015 by Michael Willison. Cortelyou, R.G. 1988. 1988 (Sixty-third) Spring Occurrence Report. NBR 56: 54-77. Silcock, W.R. 2015. Winter Field Report, December 2014 to February 2015. NBR 83: 3-21.